You play some “airy” orquesta, such as Biagi, and realize that the audience simply does not hear half of what you play, so you increase the volume and… any of the above starts happening. While some of the above might be solved with a creative use of an equalizer, in the cases where the core problem lies in the loudness of the signal, a compressor is a more straightforward tool to use. In an extreme case of a venue with a terrible sound, where I regularly DJ-ed for almost two years, the compressor was indeed the weapon of a choice, with EQ coming into the battle at much later stage. However, I would definitely suggest to master your equalizer skills first, using the technique described in “EQ 4 TJ: Getting the Best Sound out of Your Tango Records” , and only then return to this article. Also, the other article explains some basic acoustics concepts that may be helpful for better understanding of this one. Imagine yourself deep in the night, lying on a couch, and enjoying some music (it does not have to be tango, I mean it!). Also imagine your significant other having sweet dreams in an adjacent room, so you have carefully set your volume … and suddenly your music have run into a culmination. You jump from the couch and run down to your stereo system to adjust the volume… but you are not quick enough, and so, you hear a few rather unpleasant comments on your IQ, on your choice of music, and, especially, on the hour you have decided to play it. When you return back to your couch, the loud passage is finished, and now you have to adjust your volume back up again, otherwise you won’t be able to hear anything at all. You have used almost all of them when adjusting the sound. First of all, when the sound became louder than, in your opinion, would’ve been tolerated from the adjacent room, this was the theshold, at which you have made the decision to change the volume. Next, the time it took you to run to your stereo system and to bring down the volume is called the attack time. In real compressors it is measured in milliseconds. Obviously, you did not qualify. The time it took you to think over the decision to make the music louder again, and, to actually execute that decision is called the release time. The real compressor thinks fast, and also, it takes into account not the opinion of the significant other from the adjacent room, but the actual speed of the music, and so, it can automatically adjust the release time, according to this speed. This is called auto release, or, program release. Not all compressors are equipped with auto-release, but this particular feature is very desirable for master buss compression. And, finally, the ratio between two positions of your big, friendly volume knob describes, although not precisely, the compression ratio that you have applied when you brought the volume knob down. In order to tackle the real-world compressor, like on a picture above, we need just two more examples. Firstly, suppose that you have a remote control to your amplifier. In this case your attack and release time would be significantly better, and you might even manage not to wake up your significant other, but only if you would continuously adjust the volume, e.g. bring it more and more down when music becomes more and more louder. Now you are behaving as a perfect, so called soft knee compressor, ideal for the task at hand. In the previous example you were more of a hard knee compressor, with two fixed position of the volume knob. On some compressors the shape of the knee can be either toggled, or continuously controlled. Compressors that do not have such control, usually state in the manual, whether they are soft or hard knee. Secondly, suppose that the sound level is perfect for you, yet, you are forced to lower it, based on a complaint from your significant other, or your neighbor, or your friendly local police officer. Now you are acting in a so called side-chain mode. That is, the decision to lower the volume is made based on some kind of the outside influence, not on the actual sound level, hitting your own ears. A practical example of a smart side-chain filter would be to lower not the overall volume, but only the volume on your sub-woofer to address the neighbor complaint. The side-chain LF filter may be embedded into your compressor, in which case it is controlled by a knob called Filter or Side Chain Filter (SCF). For external control, there is usually a socket, called Side Chain on the back of the compressor. Now, don’t you wish your significant other (neighbor, etc.) would have a Super Nice button?! There are two distinctly different ways to use compressor in the recording studio. When a recording is mixed, compressor is used to creatively distort the sound of a specific instrument, or a group of instruments for a special effect. Shaping a rather sloppy voice of a singer into something more acceptable for the listener, or overall shaping of the mix also belongs to the first category. However, when a recording is prepared to be released on a CD, on the radio or elsewhere, there is, usually, an additional stage, called mastering. In the process of mastering, very minimal, almost non-perceivable changes added to the sound by a mastering engineer. The key word here – almost non-perceivable. While the mix engineers talk about characters of various compressors, the punch, the pump, the warmth, and the ways how they re-shape the sound, the mastering engineers want their tools to be as transparent and as unnoticeable as possible. The studio equipment is, usually, of much higher quality than the equipment used for live sound. The mastering equipment is of the highest quality in its rank, and by its weight, size, and the price tag is absolutely unpractical for our purposes. But, luckily, we do not need mastering equipment. All we need is the simplest compressor, without a “character”, which is either preset to be transparent enough, or have sufficient number of controls that we can set in a mastering manner, and most of the compressors in the lower price bracket actually qualify for this task. If the above sounds scary, don’t worry, in the next section I am going to give examples of the compressors that I have either tried and used myself, or know for the fact to do the great job. Also, “more controls is better” rule does not apply here. A compressor is a tool that in our specific case should be of “set and forget” variety. If a compressor has a single “Compress it!” knob that controls all the rest of the parameters according to its own, inner logic, it may not be the best learning tool, but there is a very high chance that it would be the best one for the job. Also, there are two extremes in the compressors zoo, namely, an arcane cross-breed between compressor and equalizer called a multi-band compressor, and overly-simplified one-knob compressors in some mixer channels intended only for the voice microphones. They have their own use, but neither is suitable for our purposes. Finally, in your search for the compressor, you might stumble across a so called leveling amplifier. Those are well suitable for our use, as they do exactly what their name suggest – by using no-threshold, non-linear compression they smoothly reduce the dynamic range, but chances are that the price tag will be prohibitive. If, however, it is not, by all means, go for it. I assume that you have already made a choice between analog or digital processing, and, in the latter case, know how to include a new plugin to your sound chain. If not, check “EQ 4 TJ: Getting the Best Sound out of Your Tango Records” first. In the software domain, we are lucky to have a free, and yet, very capable compressor “Molot” by Vlad Goncharov. This beast with a mean look of a military device from Cold War era has quite a complex interface, produces the sound which is far from being transparent, its 50 page manual can be called anything, but easy or entertaining (ever read a military manual? ), but if you really want to learn what compressor is about – just get it. If, by default, the interface is in Russian, search for “EN” label at the bottom and press it. On the other end of the spectrum lies free “single-knob” compressor MJUC jr by Tony Frenzel. A sophisticated emulation of an early-days vacuum tube variable-mu compressor is hidden under an eye-candy interface. This is, probably, the only compressor where the coloring is a good thing, indeed. There is also a commercial version, MJUC, that comes with several distinct flavors and more knobs to tweak, and a very reasonable price tag. 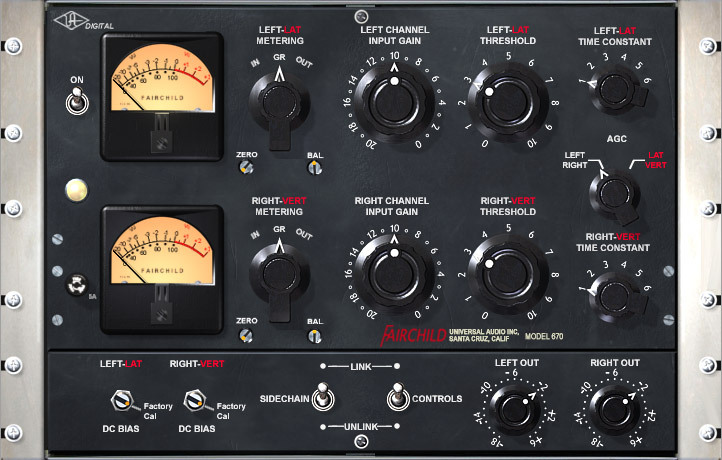 A large collection of various free compressor plugins can be found in this review. And in the department of unreasonable price tags, there is always the Waves collection. My personal favorite from there was API-2500, but I routinely carry a 2o kilogram box full of hardware anyway, so let us move on to the hardware models. De-facto standard hardware compressor in the low price bracket is RNC-1773 from FMR Audio. RNC stands for “Really Nice Compressor” and it is an understatement. Use it in “Super Nice” mode for your DJ-ing, or in a normal mode for fixing extreme problems, or side-chain it with an equalizer and learn the concept of a de-esser and side-chaining in general, in mono or stereo, or use it as a paper-weight or a design element in your office – it is indeed perfect for any of the above. On the other end of the spectrum lies channel strip Tube MP/C with a minimalist compressor from ART Pro Audio. I have used it for well over a year, before switching to RNC, in a milonga venue with really terrible acoustics, and still use it as a voice channel for live performances. It is definitely not a high-end offering. Its tube stage requires rather precise settings to produce decently warm sound, and yet, not to overload itself, while overall you can clearly hear the coloring and the noise added to the sound by this unit. But, paradoxically, its coloring and noise actually made the sound in the milonga noticeably better. How that could be possible? I do not want to delve into the deep waters of psycho-acoustics or recite audiophiles’ legends, but the fact that the improvements to the sound, produced by this little box with cheap Chinese vacuum tube in a rather cavalier low-voltage circuitry, were heard by pretty much everyone in the milonga, made me to search for at least some reasonable qualitative explanation. The explanation that we made up with a professional sound engineer was that first of all, there are indeed objective and measurable qualities of a vacuum tube stage that are liked by our brain. This includes the preference toward odd harmonics and toward lower sub-harmonics, as well as smearing effect of a cheap tube. However, on the top of it, the added analog noise of the unit masked (or, in professional parlance, dithered) the digital artifacts that otherwise would’ve been only amplified by a dreaded class D power amplifier in the venue. Those two effects, combined, attributed to the better perception of the sound, when the unit was introduced, even with disengaged compressor. On the top of it, when used as a voice channel, its far from perfect circuitry makes the voice to sound older, almost as if it is coming from the 40-s. If your inner scientist has a problem digesting the above claims, just skip it, and consider the whole story to be a myth. ART Pro Audio is not a well established name in the sound engineering domain. If you want a standard 1U rack model from a well known manufacturer, then DBX is your best friend. DBX 266xs will perfectly do the job, producing a clean, uncolored sound, with minimal tweaking in their “auto” mode (I’ve used this one in a voice reinforcement system for my day job – clean, precise and honest unit), or, if you wish, you could look at their advanced offerings, such as legendary DBX 160A that you can get from the second hand market. However, if I were in the market for the compressor today, my personal choice would definitely come from Summit Audio, namely TLA-50. After hearing the very first time the sound of their parametric equalizer FeQ-50 I can wholeheartedly recommend any of their products. This particular compressor is of “we will do it for you and won’t tell you how” variety, e.g. it is a leveling amplifier, rather than a conventional compressor. The compression ratio is tied to the gain in some internal circuitry, the attack and release are also programmed, although you have a choice of two hints – fast and slow, so, overall you have just one knob to worry about. Not a good learning tool, RNC unconditionally wins in that department, and the price tag is rather steep, but if you have some spare cash, I simply cannot recommend anything better than TLA-50 / FeQ-50 combo. All in all, there is no shortage of various compressors on the market, and if any of the above is not suitable for you, I am sure that you can find something, either new or used, which would be to your liking. Set knee to soft if you have a choice. This means that the compressor will slowly increase the compression ratio, depending on the signal strength, instead of immediately applying full signal reduction, thus making its working even less noticeable. If you know for a fact, that yours is a hard-knee compressor, better exchange it. Set link to On, if you have a stereo compressor, and then use controls and indicators only on its left channel. Your left channel controls are now applied to both L and R channels. Set the VU meter switch to GR (gain reduction) if you have such switch. If you don’t, your VU meter is already in gain reduction mode. If you don’t have VU meter, either as a LED bar or of a retro variety, with the needle, you are using something else, not a compressor. Find a compressor and start the checklist from the top. If you have a side-chain filter, turn it off when learning, and set it to a rather high threshold around 250 Hz when playing on milonga. If you are using RNC, make sure that Super Nice mode is Off when you are learning, and On when you are playing on the milonga. Depending on position of this switch you would have to apply different values of the Threshold and Makeup Gain. You have reset these two knobs to zeros, have you not? If you are using Molot, its preset for “Master buss” is way too aggressive for tango music. Use the same magic values as were suggested above. If you are wandering where the magic values 30 msec, 0.5 sec and 2.5:1 came from, read the review of the Shadow Hills Dual Vandergraph. All suggestions floating around the net how to set the parameters for the master buss compressor quote rather similar values, but this specific set seems to be the most appropriate. Overall, to minimize the presence of your compressor, you want to err toward larger values for the attack and release, and toward smaller value for the ratio. We will set the threshold in such manner that the loudest peaks in the music are smoothed out. The overall level will necessarily decrease. We will use make up gain to bring the level back, almost to the same perceived loudness at the peaks. Not only the overall level will increase, but the softer passages will become louder and better heard. Or, in other words, we will make our music denser, without making it louder. To our ear it will sound louder, but objectively, it will not cause any detrimental effects. Now play some music. I would suggest either Juan D’Arienzo or Carlos Di Sarli in the 50s, depending on your preferences, or, better yet, Rodolfo Biagi from 38-40. The rule “play it loud!” still applies. Also, the noisier is the record – the better for out purposes. Audible increase in the noise level will be a good indicator that compressor indeed does its job. Look carefully at the VU meter. Make sure that it is not showing any reduction, e.g. only one LED is lit, or the needle is in extreme right position. If it is not so, turn Threshold completely clockwise. Now start rotating the Threshold knob counterclockwise, until the indicator shows about -6 dB reduction at the peaks of your music. Make sure that at the softest passages the needle returns to zero. When you have achieved the desired reduction note that you music is less loud than it was before. You did not notice?! Well, this is what In/Out button is for. Change it to Out and then In again. And again. Now, when you hear the difference in the loud passages, use Gain knob to make the volume on the loudest passages almost the same in both In and Out positions. When you are done, keep pressing the In/Out button, but now pay attention to the softest passages, or even to the groove noise. You will hear that the softest passages sound louder in In position, and that the groove noise is more prominent as well. If it only seems to you that you discern any difference – don’t worry. Increase the threshold so that the indicator goes down not to -6 dB but to -10 dB and set the Ratio to 6:1, then adjust Makeup Gain again, and then listen to the softest passages. When you clearly hear the difference, return to -6 dB reduction, 3:1 ratio, and try again. This is NOT something you meed to do on every milonga. This is something you only need to learn for yourself – to discern the loudness of different parts in your music, and to understand all the pro’s and contra’s, such as increase in the noise level when using your compressor. On the milonga you are going to have just about three different scenarios, which I am going to demonstrate with RNC-1773 compressor, with the settings, suitable for this particular model. In the first scenario, when I am playing at average volumes, I prefer to use my RNC in Super Nice mode, 2.5:1 ratio with gain reduction around -3 dB. It just smooths out the music a little bit, reduces the sound fatigue in the audience, and allows to play orquestas like Biagi without undue increase in the volume. It is my default setting for any milonga when it starts. In the second scenario, when I am ready to increase the volume to the maximum levels, I know that it might hurt some people, especially those who is sitting close to the speakers. So, instead of blindly increasing the volume, first, still in Super Nice mode, I increase the threshold to -6 dB and the ratio to 4:1, and compensate it with the makeup gain first. This alone brings the perception of a higher level to the audience. Only after that I start gradually increasing the volume on the mixer. When, closer to the end, I bring sometimes the volume down, the compressor settings stay as before. After several hours of music sound fatigue accumulates, and I do not want to aggravate it with too much dynamics. In the third scenario, when I indeed have a problem with vibrating something, I turn off Super Nice mode, and then work out the perfect settings at which the something is no longer vibrating (or complaining, or else), and yet, the sound is decently loud. The compression ratio may be as high as 6:1 with gain reduction up to -8 dB. Such settings will definitely drain quite a bit dynamics out of your music, but it is nevertheless better than the something. Also, even heavily compressed signal can be perceived as deep and dynamic, if side-chain filter is engaged. It will be the same three knobs for any fully controllable compressor, namely, Threshold, Game and Ratio. Super Nice is very special to RNC and it is not the same as soft knee or program mode, which should be kept On all the time. For the leveling amplifiers, similar to TLA-50, the Ratio would be out of your concern. Rotating the Reduction knob clockwise (opposite to the conventional Threshold direction! ), you would influence both the threshold and the ratio of the compressor at the same time. But do not forget the Gain knob. To hear the wonderfully warm and rich sound of the vacuum tube stage you have to maintain an ample signal level, so do not neglect the Gain makeup knob, on any compressor. Correct working of your compressor in “set and forget” mode is only possible when all tracks of your music library are leveled, e.g. in plain English they all sound equally loud when you play them. There is wealth of software capable of leveling your music, and wealth of players that do it internally. If you find a need to readjust the volume almost on every track, then your collection is not leveled, and you will do much better service to your local community and yourself by performing this step than by adding a compressor to your sound chain. When adding a compressor to the sound chain, whether in software or in hardware, remember to place it immediately after the sound source, e.g. your player in the software configuration or your sound card in the hardware configuration. All other units such as equalizer must come after the compressor, not before. Also, set the volume of your player to maximum, set up the compressor relative to this maximum level, and then set up the volume in the venue to your liking using the mixer controls or power amplifier control. The reason is quite simple – as soon as the level before compressor is changed, you need to change the compressor settings as well, and this is something you don’t want to do. Do not neglect an internal side-chain filter if you have one. Ability to not compress the lows, namely, the double bass, and the left hands of piano and bandoneon will give your sound an additional punch and additional depth, even when it is compressed higher than normal. If your compressor does not have an internal filter, you might want to learn more about side-chain processing, and find a suitable DIY solution there. The turnover frequency, in my experience, should be rather high – around 250 Hz, however, do spend a few minutes of the sound check on the tweaking of the filter knob – depending on the milonga venue your ultimate punchy sound may come out at much lover settings. Please remember the key words – “almost unnoticeable changes”. Both when you wonder if anything changed at all, and when your settings are so extreme that you indeed hear your compressor all the time. The short answer to all questions, raised in this section is either “no” or “cualquier cosa”. The section provides longer answers for inquisitive minds. Is compressor a good thing? What about “loudness war”? What about it? Loudness war is about making the music louder, in order to sell it better, and compressor is only one of many tools in this war. We are trying to make our music denser and less loud at the same time, in order to solve a bunch of specific problems during live performance, and for this purpose compressor is our only indispensable tool. Why not to use parallel compression? Parallel or so called New York compression indeed would have been ideal for our purpose – expanding the soft passages while leaving the dynamics of the peaks relatively untouched. However, parallel compression fails miserably with noisy records. When we constantly hear the same grove noise we stop noticing it very soon. However, if the noise is periodically increased or decreased doing sshhhh…. ssshhh… this is annoying indeed. Set up parallel compression and you will hear it for yourself, at least for learning your compressor. The noise will be a perfect indicator of the exact moment when your compressor kicks in and out. You have mentioned multiband compressor. Would it not be an ideal tool? It might. But multiband compressors are prohibitively expensive, bulky and tricky to master. Never tried it, and, probably, never will. But let me know if you do. Is there a difference between VCA and opto-compressor? Which one is better? Theoretically – optical is smoother than VCA, and variable-mu is the creamiest. Practically, however, it all depends on the specific circuitry design, and, more importantly, it is better to have a cheap VCA than to drool on an expensive variable mu. As long as you avoid compressors with too much of a “character”, and those are usually quite expensive anyway, you will be perfectly fine with any design. I found a one-knob compressor on the mixing console. Can I use this one? Better if you don’t. This compressor is preset for the voice, and voice settings are very different from the master buss settings. You might not immediately hear what’s wrong with your sound, but lot of things will be wrong indeed. Besides, you want only a slightest touch of compression, and you won’t be able to set it without the VU meter and In/Out button. I found a perfect compressor in the equipment rack, but it is not connected, how do I…? You don’t. Period. Ask the venue owner or the event PA to help you, but do not mess with the multi-thousand dollars equipment by yourself. Unlike your home rack, PA/SR system may be damaged beyond repair by a single, improper flip of a switch, especially if the system contains old-fashioned vacuum tube components. I don’t hear any difference when changing attack and release times at all. Is there anything wrong? No, there is not anything wrong either with you or with the compressor… as long as it is In, and the GR needle is moving. The changes are there, but they are indeed very little noticeable, unless you know what to look for (this is where the “drum loop” examples come handy), and even then, given the rather low quality of our tango records the changes are still very little noticeable. Nevertheless, try to keep the suggested magic values – grossly incorrect settings will introduce unpleasant artifacts to your music, even though they would not be easily discernible. Version 1.8, last updated 16/06/20. Thanks for the article! One question about the sound chain: You mention to put the compressor before the EQ and not afterwards. Please, could you explain what’s the main reason for this arrangement? From the EQ point of view: when you boost your EQ, the overall level increases. So, compressor after the EQ will work against your boost, and the opposite is also true – your compressor will work against wide-band cutting as well. From the compressor point of view: you have carefully set the compressor threshold for EQ that was also carefully set for 40s. Now, you switch your EQ off, because you decide to play the 50s… and so your compressor threshold is completely off the mark, and the 50s is exactly when you need more compression, because of increased dynamic range. Same applies to non-tango master buss compression. Yes, side chaining (in this particular case) is used to let bass frequencies through without any compression or even smearing out. The actual turnover frequency really depends on the material and the room as well. I used to set it quite high, at about 250 Hz, because the main goal was to cut the screeching highs, not to emphasize bass, but now I use the values 150 Hz or even lower, to, indeed, add more punch to the music. I’m struggling to figure out how side-chaining actually works. Like you say, all DIY guides I find are for recording studios. In the RNC compressor for instance, what plugs into the TRS side-chaining jack in the back? I’m planning on using an analog EQ by the way, probably the Behringer 9 channel. You plug there TRS cable, with another end, plugged into whatever filter you want to use. RNC sends its summed signal through the Tip, and receives filtered signal from the Ring, it’s like the insert jack on the mixer channel. Basically, in order to keep lows untouched, you would need a Low Cut (!) filter with turn-over frequency around 150 Hz. The acoustic quality of the filter is not that important, as it is only going to control the compressor.